The Mercedes-Benz A-Class was the winner of our comparative review last year when we pit the hatchback against the BMW 1 Series and the Audi A3 sedan. 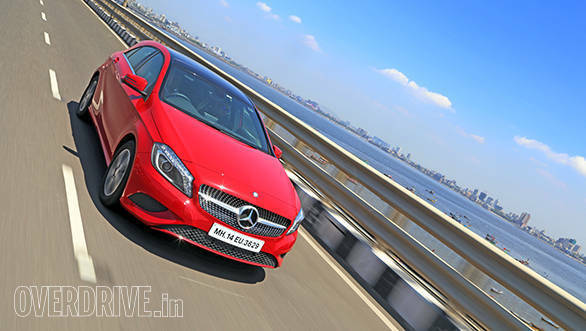 The car we compared then was the A180 CDI - the diesel powered A-Class that makes up for most of the sales for Mercedes Benz's MFA-architecture cars in India. The primary reason why the car won the shootout was its high aspiration value and a balanced driving setup - neither as focussed as the 1, nor as straight-faced as the A3. But the fly in the ointment was the engine. Though the 2.2-litre engine had adequate performance, it's rated power output of 109PS - 23PS down on the 2.0-litre engines powering the 1 and A3 - made it considerably underpowered than its rivals. 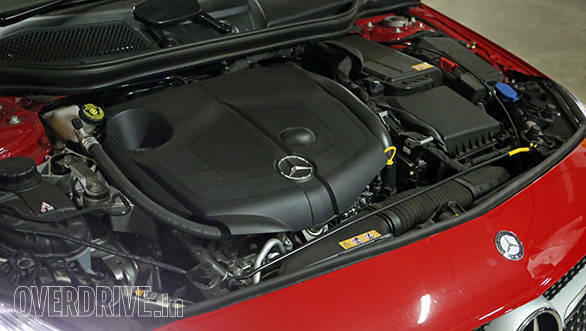 So for the 2015 model year, Mercedes-Benz has uprated the engine to produce 136PS of power and 300Nm of torque. The result is an improved 0-100kmph acceleration figure. In our tests the A200 CDI managed the sprint in 9.4 seconds making it quicker by 1.2 seconds than the A180 CDI that we tested previously. It still doesn't outclass the A3 2.0 TDI or the 118d (9.1 and 8.8s respectively), but comes close. The additional torque output reflects in better roll-on acceleration as well and in turn makes a positive impact on the fuel economy. Mercedes-Benz claims 20.3kmpl for the A200 CDI, while our overall test figure reads 15.4kmpl. We managed to extract 20.66kmpl out on the highway and 13.75kmpl in the city environment. In comparison, the A180 CDI had returned us a fuel economy of 19.6kmpl and 11.3kmpl respectively for highway and city runs, summing up into an overall economy of 13.3kmpl. Since the engine has benefited from a better mid-range now, the bump in fuel economy is noticeable more in the city conditions than on the highway. The seven-speed dual clutch transmission is still the same relatively slow unit from before. But the crisp throttle response of the new engine tune makes up for the laggy shifts. Cruising at 100kmph on the highway required about 1900-2000rpm on the A180, but the same can be achieved at 1700rpm in the A200. The engine is best enjoyed though between the 2,500-4000rpm range, where it has a beefy torque and power spread to play around with. Apart from the upgraded engine, the A200 also gets some new equipment. The panoramic roof and the electrically adjustable lumbar support that the A-Class received on the Edition 1 last year, is now standard fitment. The wheel size has been dropped from 17-inches to 16-inches and they are shod with slimmer 205/55 section tyres as compared to the previous 225/45-R17 rubber. They contribute to the improved fuel economy and haven't had a big impact on the overall handling characteristics of the car in urban environments. But push the car hard and it feels a tad skittish and stepping on the throttle at standstill can lead to a wheel spin even if you are launching the car in the Eco mode. The A200 also gets the longer travel suspension that debuted on the Edition 1. The setup is stiff enough to keep the A200 almost flat through corners, but has enough to give for a cushy ride over undulations. The ride becomes choppy and noisy over sharper bumps though. The cabin has minor changes too. The leather and fabric upholstery from the Edition 1 find home in the A200 too. 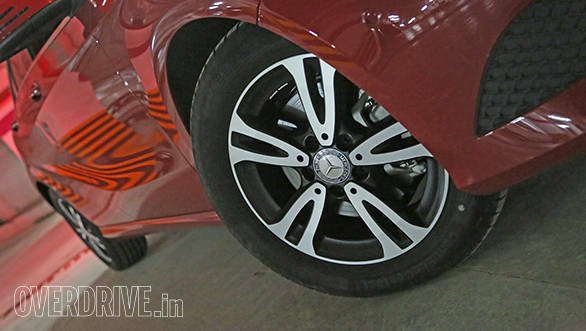 The instrumentation has been given a facelift and the silver dials make way for all-black ones, like in the updated B-Class. But unlike the B-Class, the screen for the infotainment is still the same and runs the older software. The new, larger screen with the updated COMAND infotainment will only come next year with the upcoming A-Class facelift. Another reason that had helped the A-Class win its battle with the A3 and 1 Series was the price. 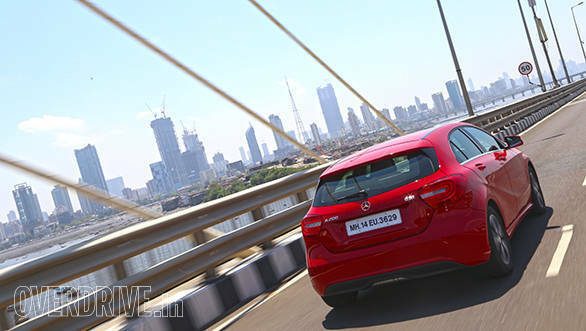 The A200 takes it up a notch by being dearer by almost a lakh. But for the significant improvement in engine performance, better fuel economy and better equipment, it is still a small price to pay.